WHAT: Masters of Scale, the inventive business podcast hosted by iconic Silicon Valley investor and entrepreneur Reid Hoffman today debuts its highly anticipated second season. The show’s mission is to ensure that everyone with an idea has the tools to scale it. The program connects the dots between stories of famous founders, with the aim of illuminating big concepts and simple hacks that can change everything. In Season One, Hoffman set out to prove theories that explain how great tech entrepreneurs scale their companies. Season Two applies Hoffman’s theories beyond Silicon Valley, with entrepreneurs from across industries. 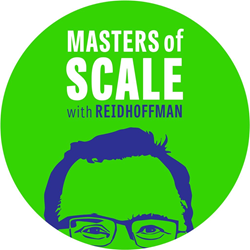 About Masters of Scale: Masters of Scale is an original podcast hosted by LinkedIn Co-Founder and Greylock Partner Reid Hoffman showing how companies grow from zero to a gazillion. The series unfolds like a music-infused detective story as Hoffman tests his theories with famous founders. Season One guests include Facebook’s Mark Zuckerberg and Sheryl Sandberg, Google’s Eric Schmidt, NetFlix’s Reed Hastings, Airbnb’s Brian Chesky, Evite’s Selina Tobaccowala, Crisis Text Line’s Nancy Lublin and Bill Gates. Created by content incubator WaitWhat, Masters of Scale is the first American media program to commit to a 50-50 gender balance for guests. About WaitWhat: WaitWhat is a first-of-its-kind content incubator that invests in, develops and nurtures original media properties. Founded by June Cohen and Deron Triff, former TED executives, WaitWhat brings genre-defining media into a world hungry for originality, authenticity and optimism. As a content incubator, WaitWhat combines exceptional creative capacity and distribution know-how to launch new media properties that include podcasts, video series, virtual reality and apps. The company's media properties all incorporate "wait, what?" moments that light an audience up and make people feel alive — inspiring them to share with others. For a combined 16 years, Cohen and Triff led TED's media operations, growing TED Talks from zero to 1 billion views/listens each year through launching TED.com, the TED Open Translation Project, TED Radio Hour on NPR, TED in Cinema, and nearly 100 distribution partnerships around the world. Cohen was previously VP of Content at Wired Digital; Triff was previously VP of Digital Ventures at PBS.